An experienced Heatherlea leader will join the voyage with 8 or more Heatherlea clients. Prices from £3795pp. Price based on twin private cabin with porthole. Price quoted is for voyage only, plus services of your Heatherlea Leader (with more than 8 clients). Cabin upgrades can be arranged on request. Triple/quadruple private cabins available at lower prices, please ask before you book! Singles welcome if willing to share only. Flights from London (or elsewhere), and overnight stay in Oslo/Longyearbyen can be arranged on request at cost price. Please book early to obtain the lowest price for these elements of your holiday package! NB Book this cruise, flights and land accommodation with Heatherlea, and you benefit from the protection of our ATOL Licence for all elements of the package. You also have the benefit of our Tour Operator insurance, and the knowledge that your payments are safe in our Clients' Deposit Account. Additionally, you will benefit from the services of a Heatherlea Leader, (with more than 8 clients). Please note we only have very limited availability on this departure, so book early! The first adventurers setting foot in new Arctic lands must have been astonished by the dramatic scenery and rich wildlife. In 1596 the Dutch captain Willem Barentsz discovered a land he called ‘the new land of the pointed mountains’, which in Dutch was rendered as ‘Spitsbergen’, the former name of the whole of this remote northern land. 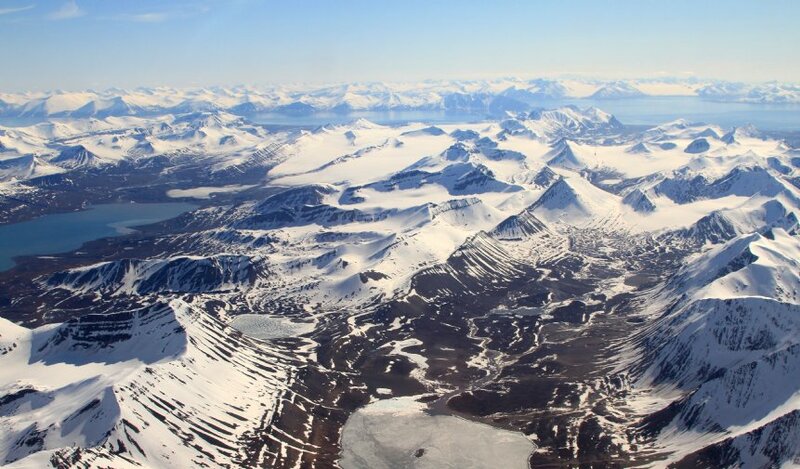 Today, Spitsbergen is just the largest island in the archipelago of Svalbard - literally ’the cold edge’ as described in traditional Norse accounts of the area. On this holiday you too can experience the majesty of these North Atlantic islands, only 800 miles from the North Pole, as we explore one of the last great wildernesses on earth. Spitsbergen is home to countless birds, nesting on spectacular cliffs where glaciers mirror the sunset, seemingly setting fire to the mountain tops. 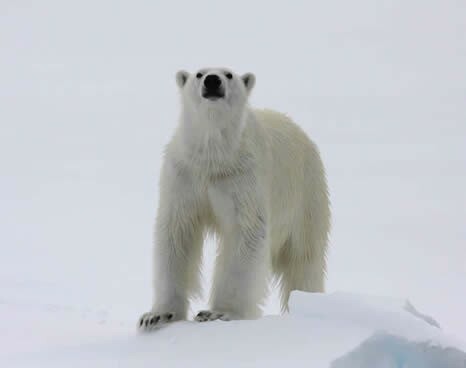 There is more too — nothing can prepare you for your first sighting on sea-ice of a Polar Bear, undisputed king of the Arctic and a key highlight of this fabulous wildlife adventure. 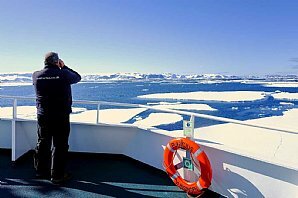 We will sail at the rim of the Northwest Spitsbergen pack–ice and concentrate on bear and whale observations on this departure. We visit in summer, taking advantage of long daylight hours when temperatures are not severe. 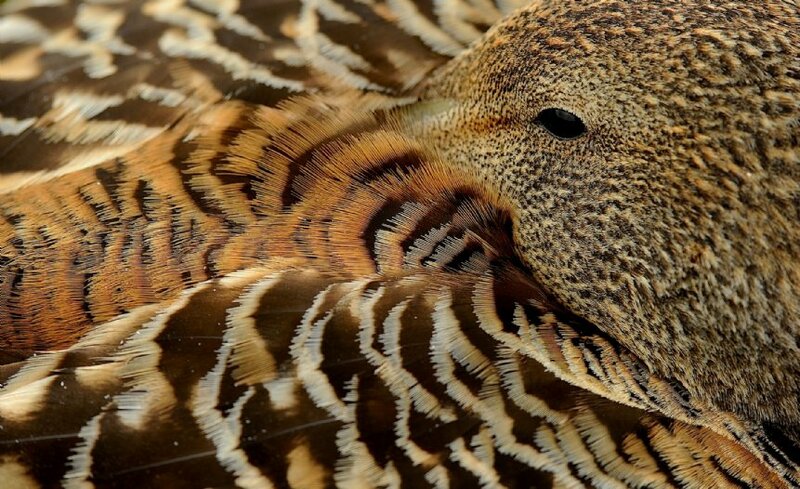 Our voyage coincides with the breeding season for most bird species, and you will never forget the wonderful wildlife of this harsh, beautiful landscape. Be sure at the end of the day to spend time outside on deck and marvel at the low sun, lighting the mountains as the sea turns a vivid orange-pink. It may be some time before you make it back to your cabin! Our vessel will be a small ice-strengthened vessel ideal for this type of voyage. Our friendly and experienced crew will be anxious to share their knowledge and enthusiasm, and we will navigate safely through pack-ice and narrow waterways. We will be flexible in our itinerary, paying close attention to weather and ice, changing course and using inflatable zodiacs amongst the ice-floes, spending as much time ashore as possible. Expect a friendly intimate atmosphere in a cosy and comfortable onboard environment. 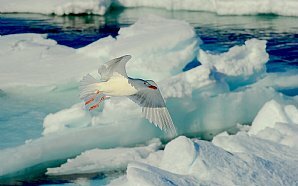 Join the Arctic wildlife trip of a lifetime! ‘The fair breeze blew, the white foam flew, the furrow followed free, we were the first that ever burst into that silent sea’. 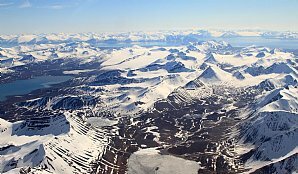 Fly via Oslo across the Barents Sea to Spitsbergen, arriving in the capital Longyearbyen. Your first night will be spent either in Oslo or Longyearbyen, depending on availability of flights and vessel sailing schedule. Please note this part of your holiday is not included in the headline price above, and must be booked separately. Longyearbyen is a former mining and scientific centre, named after an American mining engineer. Today you should have some time to acclimatise in this fascinating and picturesque northern settlement of around 2000 people. Birds here include Glaucous Gull, Purple Sandpiper, ‘Svalbard’ Ptarmigan, an Arctic Tern colony, Snow Bunting, Barnacle Goose, Northern ("borealis") Eider, and also short-legged Svalbard Reindeer, Little Auk, Arctic Fox and Svalbard Poppy close to the town. 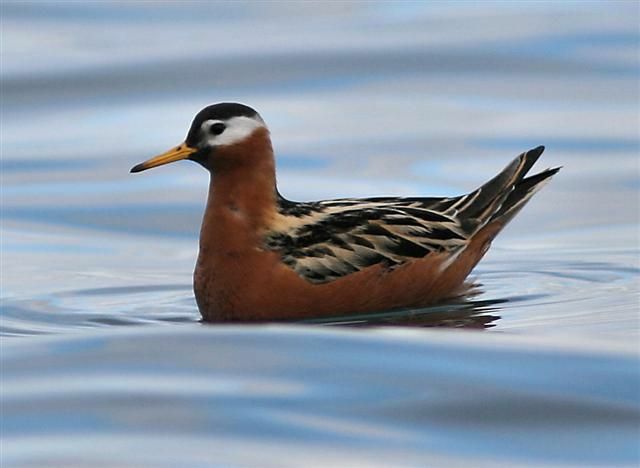 Grey Phalarope may also be possible. There should be an opportunity to do some sightseeing, visit the Museum or go shopping. You join the M/v Ortelius late this afternoon, and after our safety drill and briefing, sail north up the west coast in early evening. ‘Blue’ Fulmar, Little Auk, Puffin, and Brünnich’s Guillemot can be expected. Depending on the weather we may now sail to the mouth of Liefdefjorden and possibly go ashore for a walk on the tundra island of Andøya. 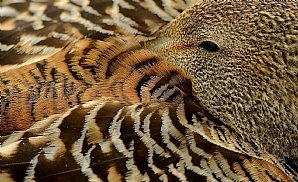 Many Common Eider and Pink-footed Goose nest here, and the rarer King Eider may also be seen. We hope to sail into Liefdefjorden, cruising near the 5km long face of the impressive Monaco Glacier. 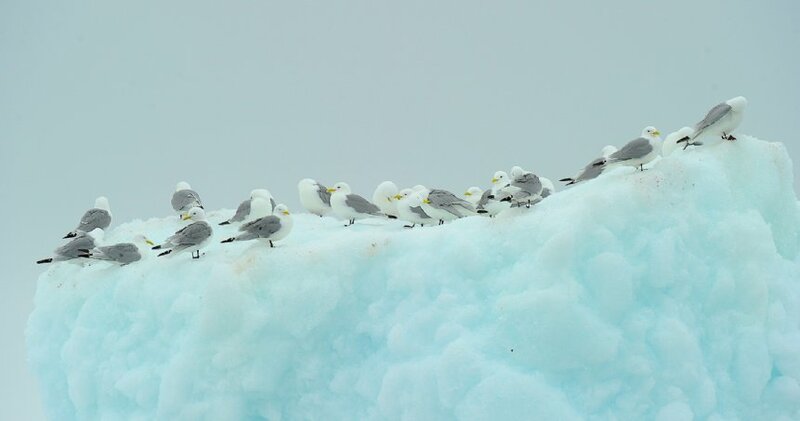 The waters of the glacier face are a favourite feeding spot for thousands of Kittiwake and on previous voyages Polar Bear have been seen on the glacier, providing wonderful opportunities for photography. Today we will sail into Hinlopen Strait, home to Bearded Seal, Ringed Seal, Polar Bear, and Ivory Gull. At the entrance there is the possibilityto see Blue Whale. 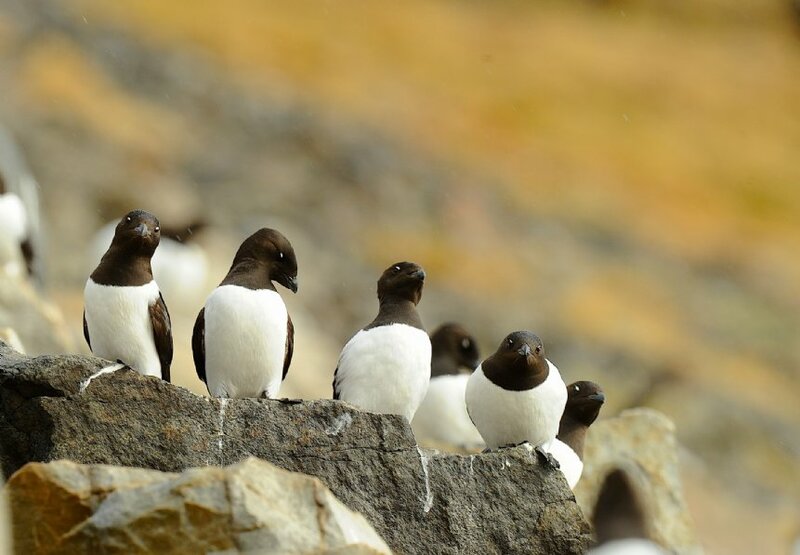 We’ll navigate the ice floes of Lomfjordshalvøya in our zodiacs and explore the bird cliffs of Alkefjellet with thousands of Brünnich’s Guillemot. 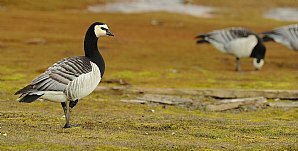 On the east side of Hinlopenstrait, we’ll attempt a landing at Palanderbukta on Nordaustlandet, home to reindeer, Pink-footed Goose, breeding Ivory Gull, and Walrus. 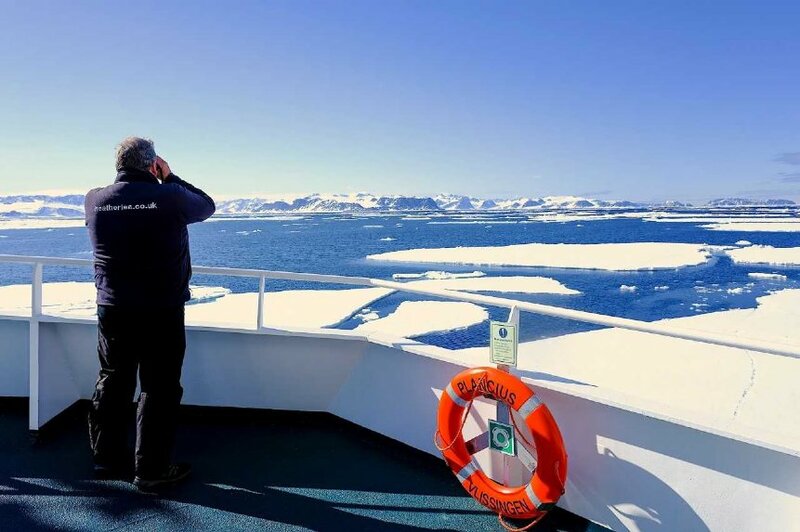 Retracing our route westwards, our route takes us through and along the pack ice, keeping watch for Polar Bear and the elusive Greenland Whale (Bowhead). About 40 nautical miles west of Spitsbergen we sail along the edge of the continental shelf, where Fin Whale forage in summer in the upwelling's along the Spitsbergen banks. At the mouth of the Kongsfjord we have also good chances to see Minke Whale. We travel to Forlandsundet at Sarstangen, a haul out place for Walrus. 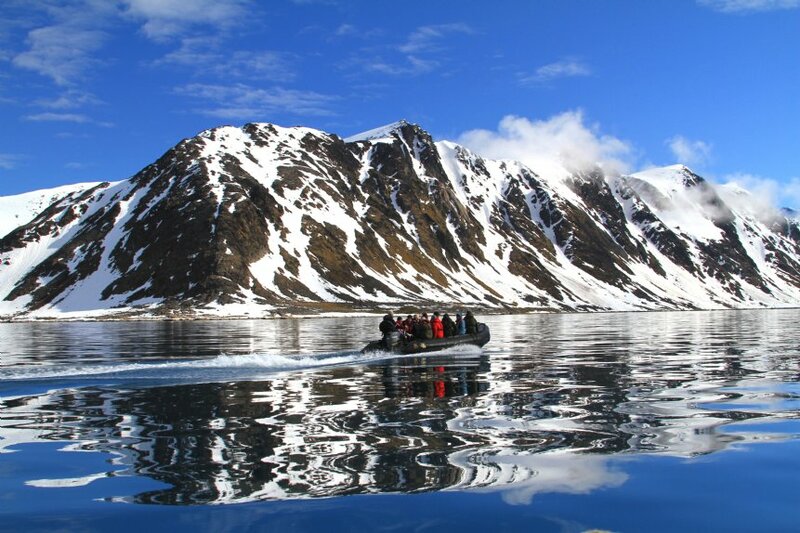 Alternatively we sail into St. Johns Fjord or south to the mouth of Isfjorden and land at Alkhornet. 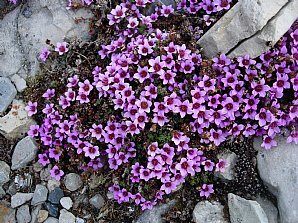 Seabirds nest on its cliffs and Arctic Fox search the cliff base for fallen eggs and chicks, while Spitsbergen Reindeer graze the relatively luxuriant vegetation. The reindeer may seem unbothered by human presence, but this is not really the case. The animals must survive the harsh winter, when temperatures plummet and food is hard to find, so they preserve what energy they can, fleeing only when it is absolutely necessary. In the afternoon we cruise through beautiful Borebukta, following a glacier face before continuing to Longyearbyen. 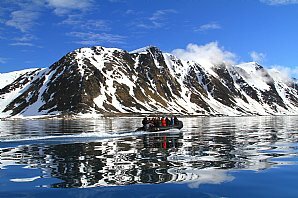 The itinerary will of course depend on weather and the presence of ice, though you will experience a thorough and rewarding exploration of the archipelago and its wildlife. Oceanwide Expeditions has a team of resident onboard expedition staff. You will be joined by one of our experienced Heatherlea guides with more than 8 clients. Summer at this latitude features generally settled weather, with light winds and perhaps a little rain. Temperatures should be between minus and plus 5 degrees Celsius. Sea conditions are unlikely to be adverse. Days are long, and you can expect wildlife to appear at any hour. We expect more than one sighting of all key birds and mammals including Polar Bear, so you shouldn’t miss anything. 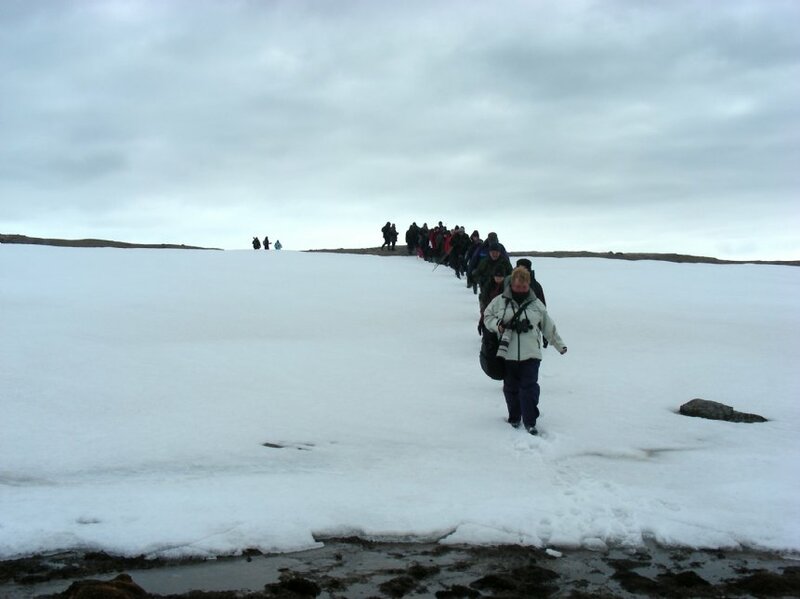 You will need waterproof boots, gaiters and wellies, and can expect maximum walking distances of around three miles, over moderate terrain (though of course most of the holiday is spent on the vessel). Biting insects are not expected. Due to the light, the dramatic landscape, and the quality and quantity of wildlife, this is an ideal location for photography. This itinerary is given as a guide only. Actual holiday content may vary according to the judgement of our captain and crew, and elements beyond our control, especially weather. Polar Bears make their way across the Arctic pack ice to Spitsbergen in winter, and our voyage to this northerly archipelago gives us excellent chances of seeing them. 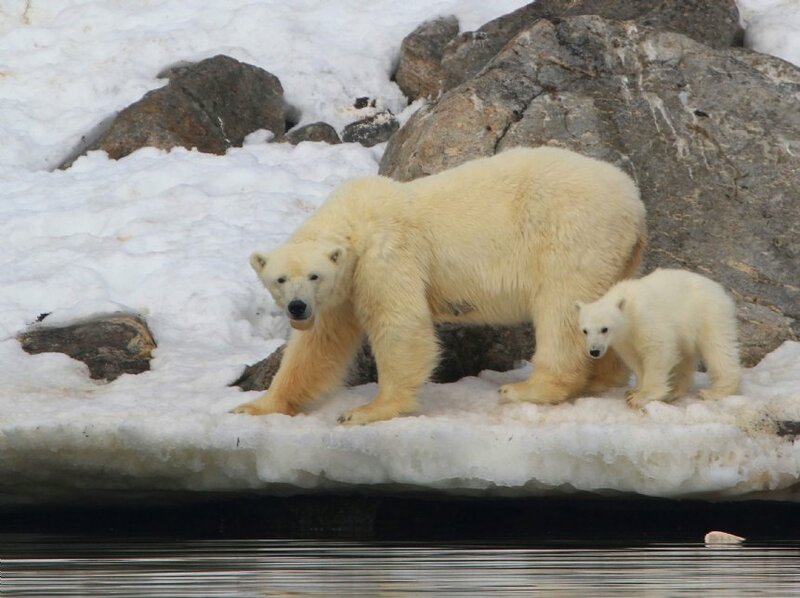 Frequently the pack ice melts in summer, isolating bears on the islands, and there is an obvious danger to Polar Bears if this recent trend continues. 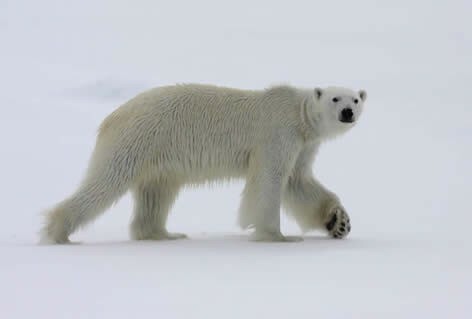 Bears need frozen sea ice to hunt seals, and although none of us can be sure of the future, it seems very possible that the Polar Bear may become much harder to find if the Arctic Ocean continues to warm. 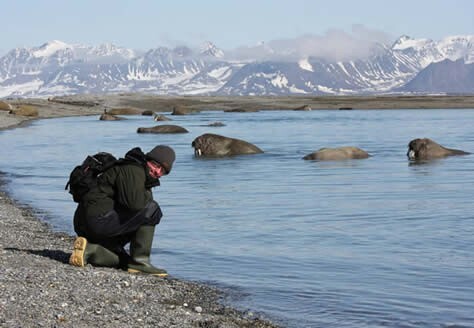 If you haven’t been here yet, put Spitsbergen high on your wildlife holiday agenda! We expect to see most, if not all, these with a chance of Ross’s Gull too! 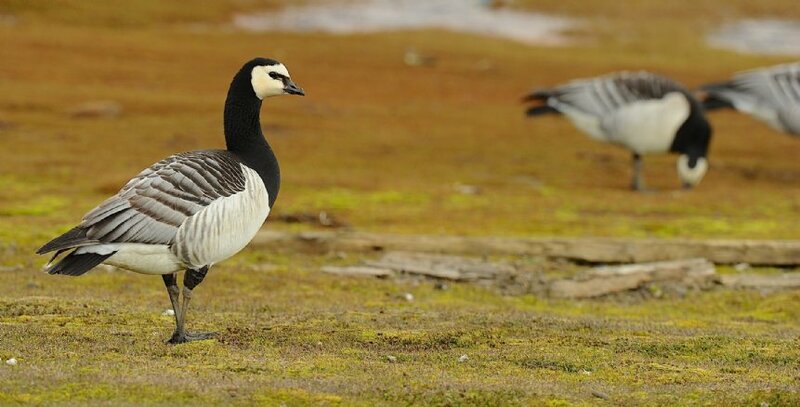 Red-throated Diver, Great Northern Diver, Fulmar, Pink-footed Goose, Barnacle Goose, Pale-bellied Brent Goose, Common Eider, King Eider, Long-tailed Duck, Ptarmigan, Ringed Plover, Sanderling, Purple Sandpiper, Turnstone, Grey Phalarope, Pomarine Skua, Arctic Skua, Long-tailed Skua, Great Skua, Sabine’s Gull, Glaucous Gull, Great Black-backed Gull, Kittiwake, Ivory Gull, Arctic Tern, Common Guillemot, Brünnich’s Guillemot, Black Guillemot, Little Auk, Puffin, Snow Bunting. 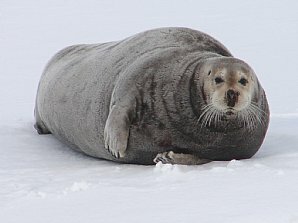 Polar Bear, Arctic Fox, Svalbard Reindeer, Walrus, Bearded Seal, Ringed Seal, Harp Seal, Common Seal, Beluga, cetaceans including Minke Whale. Accommodation: is in comfortable cabins with en-suite facilities. Food: food on board is good, European cuisine, with a choice for most courses. There is a well stocked Bar, run by the crew's Hotel staff, who are efficient courteous and very helpful. Walking: is generally light/moderate. An average level of fitness is required. 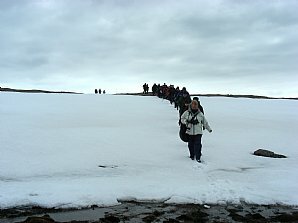 On land you will be under the management of the Expedition Leader and his team, and must take note of their instructions, which are there for your safety and benefit. Weather: will be cold, though can be surprisingly warm and pleasant. we travel in high summer, though of course at this latitude bad weather is quite possible. Warm clothing is essential, though your large vessel offers more than adequate cover and heating. Daytime temperatures can be around 5 - 6'C . Insects: biting insects are not expected, though there will be flies on the boggy landscape. Little other insect life is expected. Group size: you will part of a ship's complement of over 100 clients. There is no restriction to how many of these will be Heatherlea clients. Flights: are not included in the basic price, though can be arranged for you from any airport linked to Oslo. If you wish to add an extension either before or after your holiday, please contact us and we will be happy to arrange this for you. 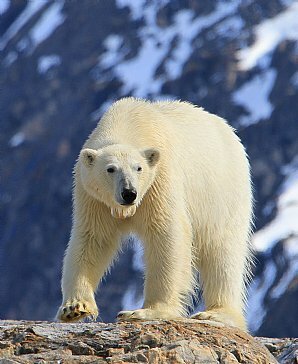 Photography: Opportunities are good, particularly for bears, Walrus, some birds and above all scenery. Your leaders: An experienced Heatherlea guide will join the voyage with 8 or more Heatherlea clients. 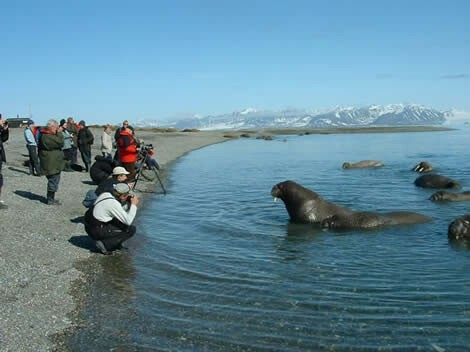 You will in any case be attended by resident on-board Group Leaders and naturalists of a very high standard. * full-board accommodation during voyage. Includes breakfast, lunch and dinner and all excursions, talks and reports provided by Expedition Leaders. * the services of your Heatherlea Leader with 8 or more clients. * holiday insurance, optional tips to ship's crew/other staff, drinks, and other personal expenses. * flights to Longyearbyen, though as above we will organise these for you. * transfers to your vessel in Longyearbyen. Locally, a bus to the airport may be provided by the boat company, though this service may not be available, in which case taxi or local bus will be chargeable. * overnight accommodation outwith the voyage and airport lounge entrance. These items can be organised for you by our team at attractive prices. * Heatherlea overseas holidays have a maximum of 12 clients per trip, putting the emphasis on personal service, and helping you get the best possible experience. (Please note there is no strict maximum to our client number on this holiday).